dispatch from 02139 (in which, after weeks of not quite belonging, something deep down inside begins to purr)…. 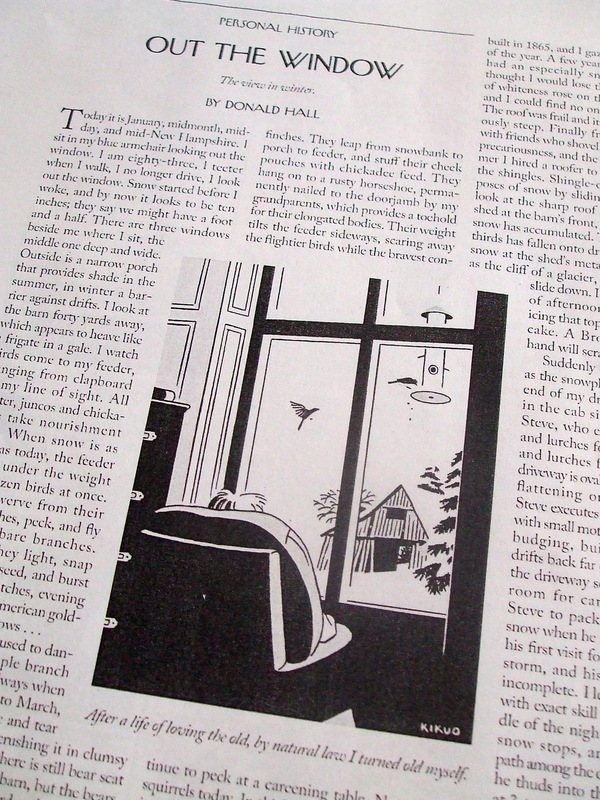 i was riding a motor coach into new hampshire, headed up to eagle pond farm, where the great poet laureate donald hall would usher us into his ancestral white-clapboard home. where we’d poke around the old cow barn, play hide-and-seek with the shafts of late afternoon light spilling onto the cobwebs and a century’s dust. where, in the parlor, in the old house, we’d crowd around the old blue chair that slumped in all the places where hall slumped because he’s been there, by the window, looking out at the barn, at the hills, at the birds, for nearly a lifetime. and he’s 84 now. because nothing in niemanland idles, little screens had dropped from the lid of the motor coach shortly after we’d pulled from the curb. it was a bill moyers film, a conversation with hall and his late wife, the poet jane kenyon. it was called, simply: “a life together.” and i’d watch it again. then she said something that made my pen move in that way that it does when i don’t want the words to escape, to whirl down the drain of my brain, never to be fished out again. not long after that motor coach epiphany, another wise woman in my life, one who knows my little one quite thoroughly, she wrote a note from back home, after i’d told her about the serious case of homesick blues that had stricken the little fellow. so, for days and weeks, as i scurried along the cobblestone sidewalks, tried hard not to trip, not to turn the wrong way, as i thoroughly drank up the otherness, i held those two thoughts in my head. 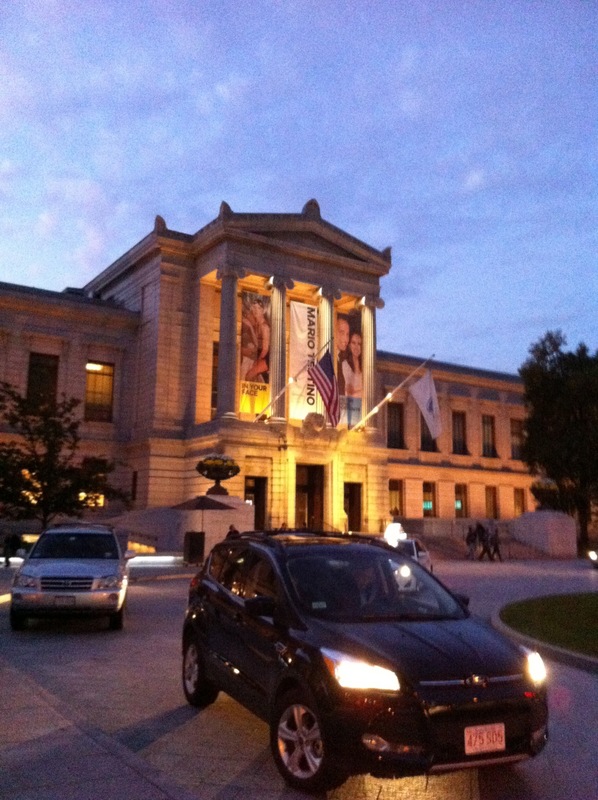 columns, almost, against which i leaned. and then i lost track. just scribbled my lists, day after day. tried to remember to turn in my papers, read all my books. dash to the store for OJ and milk and boxes of cat litter, all those things you can’t be without. people we love came and went. my brother, my sister (long ago, we ditched the “in-law” disclaimer), my sweet little niece. two dear dear old friends. and my mama. oh, and that boy from the college a ways down route 2.
and then, it turned into this week. and that’s when i noticed the purring. that deep down contentment. that rare inner rumble when suddenly you take in a breath, and you feel the whole of your lungs expanding, contracting. you know, just because you do, that each and every itty-bitty balloon of your lungs is filled to the brim with pure oxygen. you are walking along a glistening river, drinking in the endless stand of sycamore trunks, all mottled in two tones of gray, as if they’re afflicted with some sort of melanin disorder, and they can’t quite decide whether to be the color of soot or clouds on a gloomy fall day. you are, perhaps, sitting in a cafe, sipping your peppermint tea, practically knee-to-knee with a professor who is unspooling tales of his uncanny friendship with martin luther king, jr. yes, that’s what i said: martin luther king, jr.
so he tells you how the very last time he went to say goodbye to martin, after a trip to memphis where he, your professor, gave a big talk at martin’s request, he knocked at the motel room door. ralph abernathy, a name you might know from your history lessons, opened the door, and turned to get martin. at this point in the story the professor explains how, after a long day of marching and fighting for rights, king and his cronies loved to shake it all off with nothing more pure than a pillow fight. they loved their pillow fights, your old professor laughs, as if he’s watching one now. and then he gives you the image you will carry forever: so martin, he says, comes to the door, and his black head of hair is peppered with a crown of itty-bitty wisps of white feathers. a celestial vision, it seems. and later, on the same afternoon, after yet another divinity class in which virginia woolf’s “to the lighthouse,” was the subject of much parsing and digging, you find yourself scurrying down the cobblestone sidewalk to meet your dear friend, to ride on the T to the museum of fine arts, where no less than mary oliver — mary oliver whose words and questions and red birds and mornings have stirred you to trembles, to tears — will for an hour stand and read you — and a whole auditorium of others — a full slate of her poems. and you will remember the words of jane kenyon, and the wise woman back home who said it would take two months. and you will know, through and through, that at last your soul caught up with the rest of you. and now it is softly at home. in the parts of your life where you’ve up and started anew — be it a house, or a job, or a chapter of living — how long does it take, and how do you know that at last your dear soul has caught up with the rest of you? and what do you with yourself in the days and the weeks where it’s missing in action? tisn’t a nursery rhyme, and though my last name isn’t hubbard, i do feel a bit like that old mama who stood before her cupboard and found it, if not bare, at least begging. here’s the backstory: for 48 years now, the great rolling river just at the bottom of our hill (the charles is its name, so given by colonialists who offered a nod to their faraway king) has been the site, every third saturday and sunday in october, of what’s billed as “the world’s largest two-day rowing event,” drawing some 9,000 rowers from all over the world, who will put boats and oars into the water, and row, baby, row. 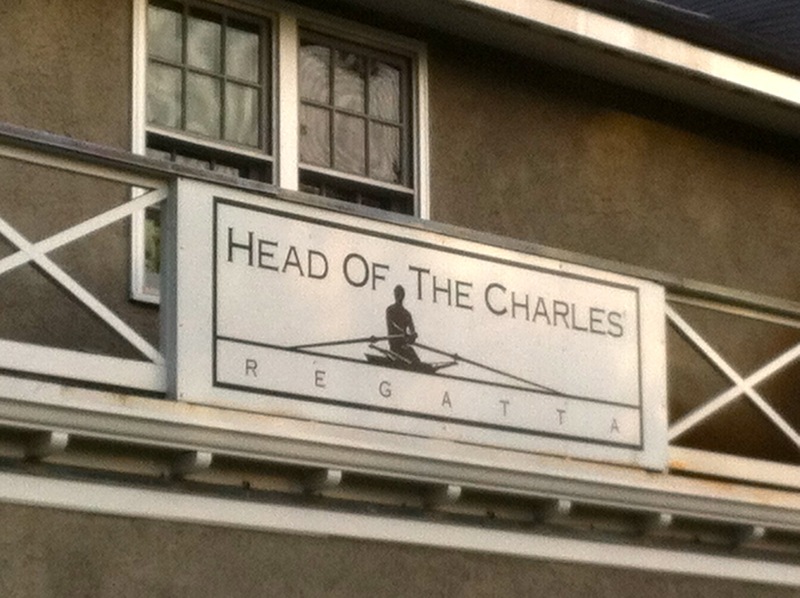 it’s called the head of the charles regatta, HOCR for short or those in the know. and this is that weekend, which the lovely organizers refer to not merely as the “third weekend in october,” (how pedestrian) but rather as “the penultimate” (that’s second to last, you’ll recall; oft-confused, wrongly, as best of the best) full weekend in october. (this is cambridge, people, where words are pulled from the highest of shelves, never down low where mere commoners forage). it’s a 3.2-mile paddle down a sinuous river that threads under six bridges and takes not one but two rather sharp turns, and apparently makes for some fierce banging and clanging of boats, oars and expletives, as boats that don’t make the turn smash into the flanks or the rears of those that do. sounds like a blood sport on water. and how nifty could it be that after five seasons of rowing, and lord only knows how many miles of wishing, our very own rower, that strapping 6-foot-almost-3 lad, is for the very first time dipping his toe and his oar into the head of the charles, and paddling like heck, from the start at the dewolfe boat house, near the charles river basin, way, way down to the finish, just past what’s called the eliot bridge. with his very own mama and papa and wee little brother screeching their lungs out, from high atop a footbridge that’s just down the lane from where they happen to be dwelling for this one sumptuous year. there is a God, and she must be a rower. ah, but the olympic feat for me, the one that has me up nights making my list and checking it twice, has nothing to do with oars or turns in the charles, nothing to do with coxswains and shells (the $75,000 fiberglass rowboats), and everything to do with hunger. the entire varsity boat (minus the shell, thank goodness) is crashpadding with us. that’s 1,000-plus pounds of manly flesh and bone. and that’s five bottomless tummies. heck, we’re just up the riverbank. we’ve a roof and heat. and who cares if there aren’t nearly enough beds? apparently, collegiate rowers do not. all they care about is the cupboards, and what flips from the cookstove. early on, the plan was that i’d be feeding them the eve-of feast (the carbo-load, thank the heavenly hosts, was last night in the college cafeteria, as it needs to be 48 hours pre-paddle). but, turns out, (and with college kids there are always U-turns and roundabouts) i get the post-race nosh, saturday night, and the morning-after gorge, come sunday. be still my hungry heart. i’ve stored up mounds and mounds of bread (the freezer looks like a tundra of challah and sliced-up baguettes). i plan on clearing the shelves at the grocery today of all cheeses and plump links of sausage. henhouses are on high alert, as i need, oh, five dozen eggs. for starters. and juice. oh, lord, juice. i might just dial a tanker, and have it lurch to the curb out front, unspool a hose, thread it up through the windows, and have the boys stand there and guzzle. don’t even whisper the R word — “red meat,” if you must — for i’ll be taking out loans to leverage that big whopper of a bill. and once we conquer the feeding, we shall inch our brains to that other obstacle of the weekend: the toilette. hmm. four big boys and a lithe little coxswain (pronounced coks-en, she (for often it’s a she amid he’s) is the one who sits down low at the bow of the boat, screamin’ and hollerin’ and calling out which way to turn). one porcelain bowl with seat, lid and flusher. hold that pretty thought in your head. maybe, while i’m dialing up the OJ tanker, i ought to scroll around for the port-a-potty people, and add one or three to the weekend tab. it’s just that, well, it’s going to be a page in my scrapbook that i’ll never ever forget. mostly all i can picture is the morning after, when all those tired-out muscles, those floppy hard limbs, will be splayed this way and that on the floor of this pad, and i’ll tiptoe over and through the mounds, trying to get to my skillets and oven. then, while they dream of the bends and the bridges of the great river charles, the ones they’ll have coursed — please, God — without collision, i’ll be steeped in my weekend’s challenge: cookin’ up vittles (slang spelling for victuals), to sate the hungers of my very own rower and his bottomless crew. dear chair people, and so another week passes. this one certainly held highlights: the visit from grammy (who now knows what it is to sit in a harvard lecture hall, surrounded by laptopping freshmen); dinner at the over-the-top over-baroque home of an ambassador named swanee (yes, as in the river) hunt, in which for the first time outside a church i sipped from a sterling goblet at a table set thusly for 24 hungry nieman fellows; a visit with the former greek prime minister, george papandreaou; and to round it all out, a fireside chat with the CEO of NPR, who in a previous life was head honcho at sesame street, and thus might be the rockstaringest dude in the media pantheon. so that’s it for this fine friday.i’ve a class to dash off to. and one pulsing question: how would you feed my hungriest hordes? so here we are, just an hour ago, back before i went to bed the second time, the sky out the front window that looks out over franklin street, and beyond to where the atlantic tickles the shore, it was pitch-black velvet stitched with one french-knot of a star and, dangling just above that, as if buttoned there, one silver crescent of moon. now, it’s all poufy pink ruffles, backlit in gold, an underskirt of grey inching its way up the legs of the day. the sun rises over boston, over cambridge, over the whole eastern seaboard. the wind in the willows just two yards away, it’s already starting to rustle. the forecast is gloom for today. but when you’re up early, you get the first — sometimes the only — snippets of heaven on earth. and that’s what i’m looking for here, that’s why i’ve pressed my nose against glass here of late. oh, i suppose i always knew that behind the story of this trooping off to college, me and my old-fashioned pens and my notebooks (why, i might as well dip quill into inkwell, scritch-scratch my notes onto papyrus, so out-of-date, obsolete, i do seem to be in the land of laptops and iPads), i’d had a hunch that there just might be one other plot line. one other reason for being plucked up and re-planted, half a land mass from home. i picked up on it early on. back before the start of summer, perhaps, when i first tiptoed through this apartment, spotted the books on the desk of the man who would become my landlord, yes, but more so my lighthouse keeper and guide. he had tall stacks, tomes of poetry, titles that spoke of the sacred. poetry and the divine, it was there in nearly every corner. and i kept poking along. as i trace my fingers along his bookshelves, in the weeks and months since, i’ve often felt the pull to not leave the apartment, to slide a thin volume off the shelf — any shelf — (there’s wendell berry, thomas merton, a whole thicket of mary oliver, squeezed in between wislawa szymborska, the nobel laureate; there’s e.e. cummings, emily dickinson, and t.s eliot, to run through the c, d and e’s. wallace stevens abounds, as does octavio paz, and a good dash of old robert frost). i imagine nothing so fine as a seminar for two, if you count bound pages as one half of that pair. i imagine curling up under one of the afghans i’ve pulled from high-above cabinets this week, as autumn’s chill has crept in through the windows. i’ve imagined beginning and launching my poetry school right here where i scramble up eggs, and scrub the sink of its leftover toothpaste. the school didn’t wait, didn’t dawdle. didn’t put off what october demands (for we pull up stakes, turn back into pumpkins in a mere seven school months). i knew, back in the summer, that my friend and soon-to-be landlord was writing a book, a book he told me might be the one thing in this world he was meant to make. the book arrived with a thud on my doorstep this week. it’s titled, “prayers of a young poet: rainer maria rilke,” translated by mark s. burrows. it’s a beautiful book, a book covered in gold, with a grainy turn-of-the-last-century sepia photo of the great german poet, best known, perhaps, for two works: “letters to a young poet,” published in 1929, and “the book of hours,” in 1905. “prayers of a young poet” contains, for the first time, rilke’s raw drafts of a cycle of 67 prayers and one long letter written in verse, all penned over the course of three-and-a-half weeks, back in the fall of 1899, in berlin. rilke’s God is not known in intricate trace. rilke’s God is the God of primal darkness, “not sheer absence, but…rather a gesture toward a presence we can ‘sense’ but cannot know.” darkness, burrows writes, is the place of God’s becoming — for rilke, for apostles of rilke. and so, for a student who has dwelled in the murky fog of not knowing for far too long, achingly long, these words come as a trumpet blast of hope. here, on the pages of a book that landed thwop on my doorstep, i’ve discovered a matchstick to strike in my darkness. i’m only just 61 pages in, but already i’ve felt its pull, a stirring deep where the pulse begins. i understand that i need to carve out quiet, embroider my days with stillness. it is the poetry of search. i find it here in the nooks and crannies, the holy sacred rooms this city offers. in the light-dappled pews of memorial church, on harvard yard, where i slid in yesterday morning, me and my red-strapped backpack, just as the reading began of an amy hempel story that served as scripture. and, again, just past noon yesterday, when i shoved open the great wood-planked door of the monastery at the bend in the charles river. i tiptoed in, and found the monks deep in noon song. i fell to my knees on a blue needlepoint cushion. i struck a match, and licked its flame against the wick inside a cobalt blue glass jar. 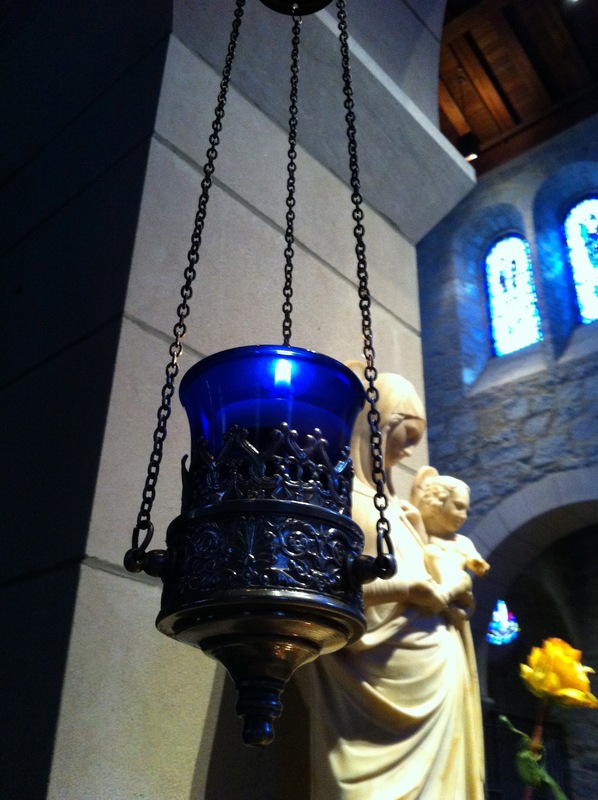 the blue glowed, a white light of halo within it, behind it. i bowed my head, and did not mind, for once, the not knowing. i am peeling back the poetry of search, and learning that in the darkness of my hours, i just might find what i’ve been waiting for, for so so long. you can find mark’s rilke book here. who is the author of your most sacred prayer? must dash (posting this as roughest of draft); long day of classes, and grammy comes in on the train from portland, maine. big weekend here in 02139.
back in the faraway house that hums without me now, back in the heat of summer, when the fog was lifting on this year of thinking sumptuously, when i first got a peek at the calendar of what the days and weeks and months would bring, my eye was drawn sharply and swiftly to a little rectangle tucked at the top of the month of october. 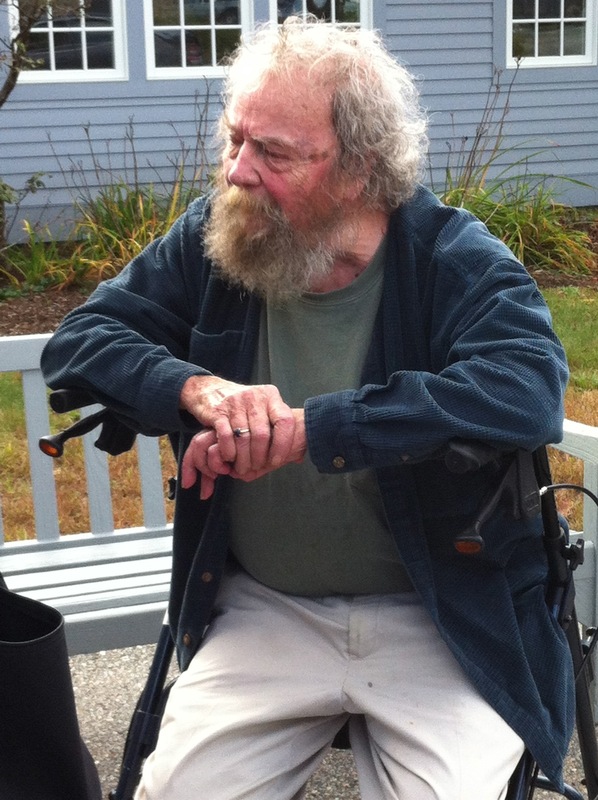 it read: field trip to new hampshire farm of poet donald hall. be still, my hurried heart. i promise you i am not indulging in the great irish art of embellishment when i tell you i nearly slumped from my chair. i slapped the pine ledge of my writing desk, slapped hard, flat palm against the knotty plank of old french pine. i gasped. i am certain, if memory serves me, i felt a quiver in my arms. one doesn’t stumble across an invitation to might-as-well-be mecca, the holy place and farmstead of an american poet laureate, just any old friday. like so many things in my life, i’d come late to donald hall. but when i did — stumbling across him in an essay in the new yorker last january, one titled, “out the window,” one you can find here — i sat transfixed by the power of his words. hall, now 84, was named u.s. poet laureate in 2006, the 14th such poet potentate of the library of congress. he has written some 22 books of poetry, at least four biographies, 11 children’s books (most notably, “ox-cart man”), six memoirs, three plays, and more. but it wasn’t till page 40 of the january 23, 2012, new yorker, that i sat up and took hard notice. he wrote there, straight through to the bottom of page 43, about aging, about growing old in a particular place, his family’s 150-year-old new hampshire farm, a place he’d long ago committed to memory. knew by heart, by season, by length of light and shadow. knew by fluttering of birds and drifting of snow on the old barn roof. he wrote words that rocket-launched into my heart, ricocheted around in there, and left me gasping, quite frankly, for air. “new poems no longer come to me, with their prodigies of metaphor and assonance. i feel the circles grow smaller, and old age is a ceremony of losses, which is on the whole preferable to dying at forty-seven (when his wife, the poet jane kenyon, died) or fifty-two (the age of his father when he died). when i lament and darken over my diminishments, i accomplish nothing. it’s better to sit at the window all day, pleased to watch birds, barns, and flowers. it is a pleasure to write about what i do. “generation after generation, my family’s old people sat at this window to watch the year. there are beds in this house where babies were born, where the same babies died eighty years later…. i could go on. but, you, please, read for yourself. check out books from your library. i did. some 17 in all. only just the other day, i checked out two more. and bought one, “life work,” a slender volume i’ll tuck inside my backpack, pull out if i get brave, hand to mr. hall, and ask, shyly, if he’d put pen to a page that is his, but lives on my shelves now. and since i promised you, long ago, that we would share the glories of this year, i wanted you to have a head start. to spend a swatch of time whirling and swirling inside the poetry of donald hall, while i poke around the clapboard farmhouse, with the narrow porch where the birdfeeder hangs. where, if i’m lucky, i’ll press my nose to the window, deep and wide, where he looks out, keeps watch, as autumn turns to winter, turns to spring, and back to summer. i’ll drink in the gnarly branches of the maple and the oak, and the “bluing air of afternoon.” i’ll tiptoe into the cow barn, built in 1865, and scan the hayfields that are the crossbeams and the vaults of a lifetime of pure poetry, born and raised and resurrected in a little town nestled in the mid-hills of new hampshire. i’ll stand deeply still. inhale and pray. words of thanks, first, for this rare gift. and begging words just after, that whatever’s in the air, the earth, the floorboards, seeps into me, and teaches me to see, out the window, in the ways that mr. hall so clearly sees. let’s start with ox cart man, a book that might be tucked on every child’s library shelf. and bundles of cards from her mother Kate. a poetry corner, where you can curl up, on this fine october day, and drink in the sounds of donald hall in his many forms. please do click on “letter with no address,” written to jane kenyon, his wife who died of leukemia in 1995. you will hear your heart crack. i promise to post dispatch, post field trip, once we’re back from eagle pond farm, up new hampshire way. if you could visit any poet in the world, who might it be, and why? and feel free to leave a line of poetry here as proof. p.s. i realize that if you don’t have a subscription to the new yorker the link above won’t get you directly into the essay, but rather to a bit about the essay. i wish i could get around that, but i can’t. your library will have a back issue of the new yorker, i do believe. if you’re stuck, i will xerox and snail mail. you can send me your address via email.